Orthodontic treatment comes in many forms these days. Orthodontic treatment can correct a “bad bite”, enhance your smile and achieve amazing results. 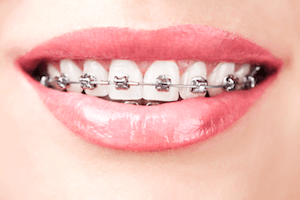 The most common form of orthodontic treatment, called braces, involves brackets that are bonded (“glued”) to the teeth for the duration of treatment as well as wires, springs and elastics. Why do my teeth look more yellow with braces? The elastic component of the braces can stain and change to a more yellow colour from the food and drink that you consume. If you are concerned about the colour of your braces, try to limit your intake of heavily coloured foods like curries – essentially any food that would stain a white shirt. Luckily the elastics are changed every 6-8 weeks so if you notice this shortly after the braces are fitted to your teeth, rest assured they won’t remain stained for the entire duration of your treatment. The paraphernalia associated with braces can mean it is more of a challenge to keep your teeth and gums healthy and clean of food debris and plaque. It is our priority to ensure this exciting time of change doesn’t affect the health of your smile long term. If cleaning isn’t maintained, unsightly white and brown marks can develop over time around the brackets and when the brackets are removed, leave permanent white and brown rectangles on your teeth. These spots are actually the first stage of decay and aren’t able to be reversed. Keeping your teeth and gums clean and healthy whilst wearing braces should be your number one priority! Angling the toothbrush into either side of the brackets, using interproximal brushes like Piksters™ between the brackets and daily cleaning between the teeth are all incredibly important. Some people struggle with the transition to braces and schedule more frequent hygiene appointments with their hygienist or dentist in order to prevent permanent damage to their smile. You might be recommended additional dental products such as Tooth Mousse Plus™ or NeutraFluor 5000 Plus™, which both assist in preventing decay. Your Medland Dentist or Hygienist would be happy to further discuss preventative strategies for ensuring your smile is healthy while undergoing orthodontic treatment. Once your braces have been removed, if your teeth aren’t as bright as you remember, or if you would like to brighten your new smile, your Medland dentist and hygienist are happy to discuss the options available for you to whiten your beautiful new smile.